The parts pictured here are film/adhesive laminated parts for a hard disc drive. The material is a .002” thick plastic film laminated with a .002″ thick adhesive. As denoted by the picture, these parts can be quite small. It is essential that these parts and the materials from which they are made be absolutely clean and free from any contaminants, which is why all processes including packaging are done in a clean room environment. We can utilize our equipment and know how to produce any part configuration from similar materials to suit your needs. If you have had or currently have similar parts being made using rotary or steel rule dies and the parts are marginally to spec, let us take a look and see what we can do to improve the parts. This type of part is supplied on a plastic film release liner on rolls. The liner can be supplied with pilot holes for use in automated assembly lines. The parts pictured here are SST/adhesive laminated parts for a hard disc drive. The larger part is a .002” thick Stainless Steel laminated with a .002” thick adhesive. 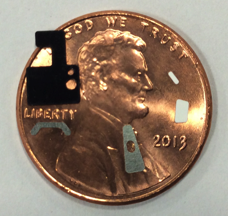 The smaller part is .001″ thick Stanless Steel with a .001″ thick adhesive. As denoted by the picture, these parts can be quite small. It is essential that these parts and the materials from which they are made be absolutely clean and free from any contaminants, which is why all processes including packaging are done in a clean room environment. We can utilize our equipment and know how to produce any part configuration from similar materials to suit your needs. If you have had or currently have similar parts being made using rotary or steel rule dies and the parts are marginally to spec, let us take a look and see what we can do to improve the parts. This type of part is supplied on a plastic film release liner on rolls. The liner can be supplied with pilot holes for use in automated assembly lines. Adhesive laminated parts of either metal or plastic film are supplied on tape rolls for ease of packaging and handling and assembly. When needed for automated assembly, pilot holes can be stamped in the carrier tape with the individual parts accurately placed relative to the corresponding pilot holes. All of the parts in this photo are precision stamped laminated parts. There are 2 Stainless Steel parts: the one with the small oval hole is .002” thick SST and .002” thick adhesive; the other is .001” thick SST with .001” thick adhesive. The black part is .011” Polycarbonate with a .002” thick electrically conductive adhesive and was used for a high-end flex circuit. The two white parts shown are constructed of .002” thick plastic film with .002” thick adhesive. All of these parts were stamped, placed on a continuous strip and wound onto reels using QDP’s proprietary process. The parts are presented on a penny for size reference.